Add a star if a fun ride matters more than the ending. 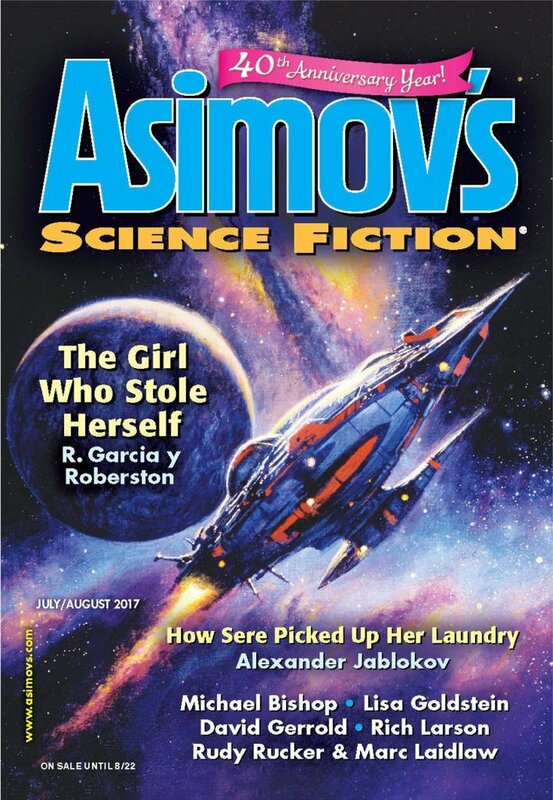 "The Girl Who Stole Herself," by R. Garcia y Robertson [bio] (edited by Sheila Williams), appeared in Asimov's Science Fiction issue 07-08|17, published on June 15, 2017 by Penny Publications. Pro: You roll in the floor laughing as this story takes your suspension of disbelief on the ride of its life. Con: The ending falls flat. It’s much too serious for the story up to that point. There are a number of writing problems, mostly editorializing. There are also a number of dumb scientific errors. For example, Phobos is the inner moon of Mars, not the outer one. World-building and fast pace overwhelm story and character. There was also some jarring contrast between fun and light versus serious and disturbing. Yeah, it definitely had its problems, but it had me in stitches much of the time. With my latest rating system I have called it "mixed" not "honorable mention," which means there was some great stuff that would make it four stars but also some bad stuff that would make it two stars. So I end up with three, but it's not "average" in any way shape or form.